Keep things simple and open with a functional center kitchen island and lots of below-counter storage. Deep kitchen drawers provide plenty of easy-access storage and they keep clutter out-of-site. Take advantage of both sides of a kitchen island for additional drawers and storage. You can add additional seating to an eat-in kitchen by extending your island countertop 14-18” (40cm) and adding a few counter height stools. Not only will you add additional eating and entertaining space, but you’ll extend your prep area. This is a great way to get family members and guests involved in making a meal. One of our favorite kitchen ideas is to give white kitchen cabinets a splash of color with colorful solid surface countertops. 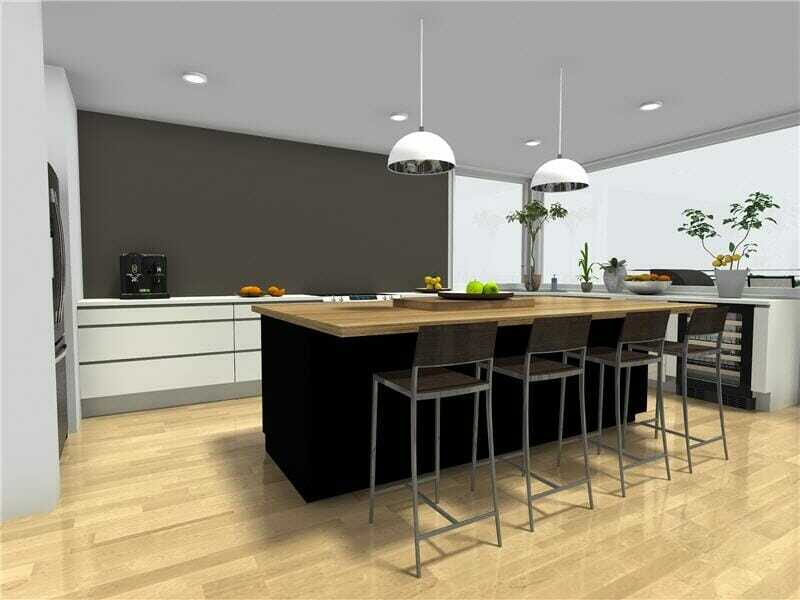 Look for popular solid surface brands such as Corian, Avonite, and Silestone. You’ll find many great colors to choose from or have a custom color made by submitting a PMS (Pantone) color or color swatch. We used Peach Echo (PANTONE 16-1548), a warm peachy orange color, in this kitchen design to create a crisp, modern and on-trend color scheme. Don’t forget about the lighting. In kitchens, lighting is very important. Illuminate your open eat-in kitchen with pendant lights. Place a row over an open countertop or kitchen island to provide task lighting. Add the same style light in a larger size over your dining table to complete the modern look. 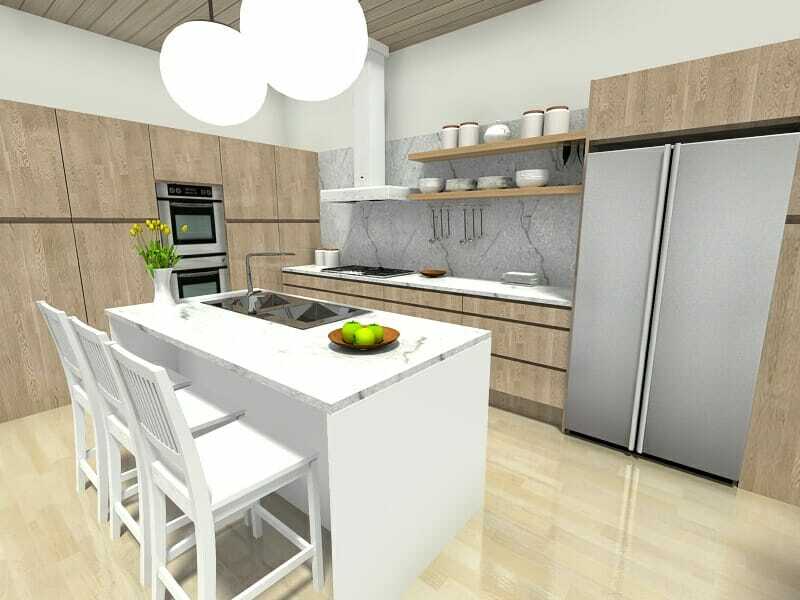 This open Kitchen idea was created using RoomSketcher Home Designer. 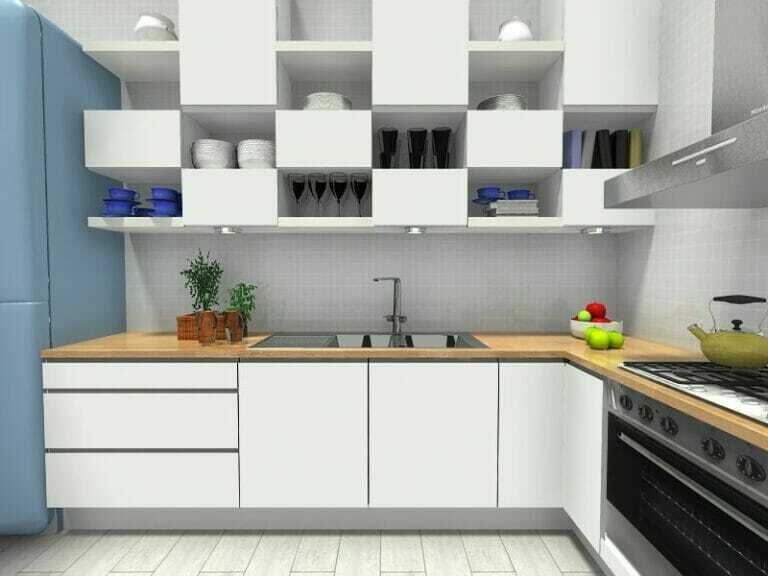 RoomSketcher Home Designer is a fantastic and easy-to-use floor plan and home design software that you can use to design your kitchen online. Simply draw your floor plan, choose fixtures and finishes, furnish and decorate, and see your design in 3D – it’s that easy!